Silver Valley Stories: Oh, the Places These Kids Can Go!! Wow, it is Wednesday already, and I haven't posted in a few days. Time flies when you're having fun, I guess. And I have been having fun this week. I have started working at Kellogg Middle School as the Gear Up Site Coordinator, and I've been doing some training in Boise and Spokane the last two weeks. But this week I was at the school. 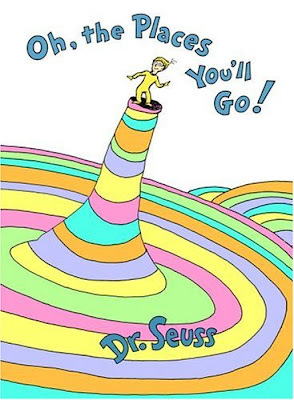 And today I got to talk to the seventh graders a bit about the program, and I had fun having the 7th graders help me read Dr. Suess's book Oh The Places You'll Go. I do it again with the 8th graders on Friday. And will you succeed? Yes! I'll be talking to kids about the mountains they have to face in their lives in order to succeed. For some, it is getting up in the morning, or getting the homework turned in, or getting to school on time. For others, it is far darker...involving poor living conditions, abuse, drugs or neglect. These are the kids I want to reach out to, the ones who feel defeated already. I want to help them have a dream. I want to show them there is hope. I want them to move mountains. And I want to be beside them helping them get to the top!! What an inspiring book to use with your GEAR UP students. I just watched the music video at the top also. Gives you much to think about.